Notre Dame Magazine, the University’s quarterly alumni publication, received five medals in the annual Circle of Excellence awards from the Council for the Advancement and Support of Education (CASE). Notre Dame Magazine was awarded the silver medal in general excellence. This award is given in three circulation categories, and the magazine competes in the largest category. The University of Chicago received the gold award in this class. Kerry Prugh, the magazine’s art director, received a bronze medal in editorial design for her layout of Gary Gaffney’s poem “Mil Preguntas: A meditation in 1,000 questions” in the Summer 2011 issue. Staff members were awarded three of 13 medals given in CASE’s Best Articles of the Year: Higher Education category. John Nagy, a 2000 alumnus and an associate editor of the magazine, won a gold medal for his Havana/architecture program article, “The Rome of the Americas.” Jason Kelly, a 1995 graduate and an editor at the University of Chicago Magazine, earned a silver medal for “The Damage Done,” his article on concussions, Peter Grant and David Duerson. Finally, Peter Graham, a 1984 graduate, won a bronze medal for his essay “When Life Hangs in the Balance,” about a little boy in a coma after being hit by a car in the parking lot of a youth soccer game. CASE is the largest international association of education institutions, serving more than 3,000 universities, colleges, schools and related organizations in 45 countries. It is the leading resource for professional development, information and standards in the fields of education, fundraising, communications and alumni relations. 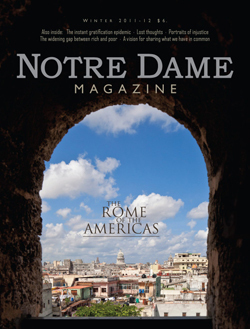 Notre Dame Magazine has 150,000 print subscribers and repeatedly has been honored as one of the outstanding publications in higher education. Originally published by Brittany Collins at newsinfo.nd.edu on June 12, 2012.